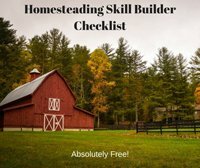 Healthy bread recipes include whole grain bread recipes and even gluten free bread recipes that create a loaf of bread the way it was meant to be; delicious, meaty, and chock full of nutrition. Bread is one of the ancient foods, and it used to be one of the simplest. Whole wheat ground into flour, water, honey, yeast and a little oil, and you were set. It's not quite that bad, but bad enough. Mono- and diglycerides - these are used to keep the oils from separating in products and to increase shelf life. Ethoxylated mono- and diglycerides - as best as I can understand, these are fats that have been chemically altered. Oh yeah, I definitely want that in my body. Azodicarbonamide - this stuff can cause asthma and allergic reactions. It's also used as a pesticide. It's been banned in Europe because tests have shown it can cause cancer. However, it is still allowed in the U.S.
Enzymes - added because the natural enzymes that were once in the wheat kernel were destroyed and the flour now has no nutrition. These can include alpha-amylase, fungal protease, and lipoxygenase. Doesn't that sound tasty? Calcium sulfate - used as a coagulant. Obviously, there are some ingredients in this bread I really have a problem with. 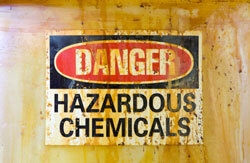 The chemicals alone are frightening enough to make you want to steer clear. But also, the flour they used is dead. No nutrients are left once the milling process is complete. The wheat kernel is removed and then vitamins have to be added in afterwards. Otherwise, people who eat it would suffer from malnourishment. 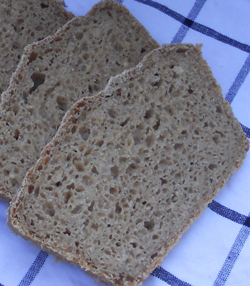 Wouldn't it be better to keep those nutrients in by using one of these healthy bread recipes with freshly ground flour? That's the beauty of grinding your own flour with whole grains and using one of these healthy bread recipes. 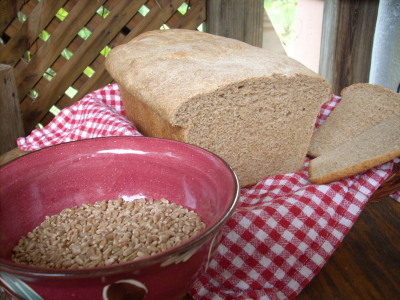 This is one of my favorite healthy bread recipes I use when working with whole grains. It works great on any whole grain. An upright mixer really helps when making bread, as it easier and much less time consuming. Yes, you can make whole grain breads without a mixer, and I used to all the time before the kids came. Now that the kids are here, I doubt I would ever make bread without an upright mixer. Grind the four cups of grain and add them to the bowl of your mixer. (If you are not grinding your own wheat, you will need five cups of whole wheat flour). Add the salt and the yeast to the flour. Turn on the mixer and mix this for 15 seconds. In the microwave, heat the water to about the same temperature as you would use to reheat coffee. I have a beverage setting on my microwave which I use. Add the oil and then the honey to the water and mix well. Turn on the mixer again and slowly add the water to the flour mixture. Allow the mixer to run for a minute and a half. Then set the timer and allow the dough to rest for ten minutes. At the end of ten minutes turn on the mixer to the number two setting and knead the dough for three and a half minutes. Put the dough in a large oiled bowl. Cover the bowl with a cloth and set aside to a warm place. When the dough has risen to double its size, beat the dough down. You can then either divide the dough into two smaller loaves or put the dough into a large single pan to make one large loaf. Cover the pan (or pans) with a cloth and allow the dough to rise for about 45 minutes. Bake in a 350 degree oven for 30-35 minutes. Remove the baked bread from its baking pan immediately and allow it to cool on a rack to prevent the loaf from sweating. Healthy bread recipes, such as this Mediterranean Garbanzo Bread add a tasty twist to whole grain bread recipes. 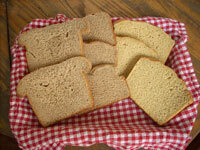 This makes a very nice, mildly sweet bread that makes a hearty sandwich and terrific toast. 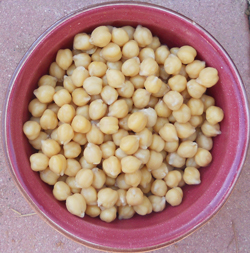 Observe the humble little garbanzo bean, also known as the chickpea. These little beans from the Middle East are loaded with protein, fiber, folate (good for your heart), manganese (provides energy and antioxidants), vitamin A, thiamine, riboflavin, niacin, pantothenic acid, vitamin B6, vitamin C, vitamin E and vitamin K along with a lot of good minerals. They also make your bread moist and delicious. This recipe comes from The Laurel's Kitchen Bread Book, a great book I have been using for years. 1 cup dry garbanzo beans (2 cups cooked. Cook the garbanzo beans in a quart of water until they are soft. Drain the beans, but reserve 2 cups of the cooking broth. Mash the beans. In a mixer, combine the flour, salt and garbanzo beans. Stir the honey into the bean broth. Make a well in the center of the flour and add the yeast mixture and the bean broth. Turn on the mixer and mix it for 1 minute to get all the ingredients incorporated. Let the dough sit for 10 minutes and then turn the mixture on and beat at medium speed for 3 and a half minutes. (If kneading by hand, knead for 20 minutes). Turn the dough out into a greased bowl and allow it to rise for about an hour. Punch the dough down and place it in two greased, loaf pans. Allow them to rise for about 45 minutes, then bake in a 350 degree oven for 45 minutes.